First, it is important to determine who Charles S. Marden is in relation to Edward Sr.. Charles, his father, and grandfather all correspond with the author of the Annis Genealogy. Their letters are transcribed in the Annis Genealogy giving family information. So, by their own admission, Charles was born in Randolph, VT in 1864, son of Riley Hull Marden. Riley Hull Marden was born in Albany, VT in 1832, son of Joseph Annis Marden. In 1882 Riley Hull Marden moved to Minnesota with Charles. Riley died there in 1900 (before these letters were written). Riley’s father, Joseph Annis Marden, was born 19-Feb-1811 in Lyman, NH and died in Wisconsin in 1901. Joseph lived in Albany and Randolph Vermont until the 1850s when he migrated to Wisconsin. Joseph Annis Marden stated he was the son of Edward Marden (this would be Edward Jr.) and Elizabeth Annis. 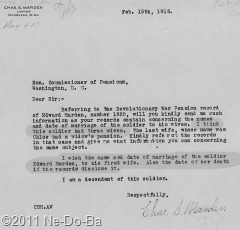 In this 8-Feb-1909 letter, Charles tells the Pension Commissioner he is looking for information about Edward Marden of Gilt Hall, VT who served in the Battle of Bennington in a NH Regiment. He states the soldier also served in April 1775 at or near Lexington. He goes on to mention his father told him about visiting Edward’s widow and seeing her pension checks. It is important to note that Charles only “believes” this information is about his ancestor. Charles seems unsure if the military service information he cited is for his ancestor. This suggests to me the information did not come to him from within his own family or perhaps it was something he heard many years ago and he does not trust his memory of the details. As “a lad”, Riley Hull Marden “often” visited a widow collecting a Rev. War soldier’s pension. Census records show Riley spent his youth in Albany and Randolph, VT. The fact his visits were often suggests the widow lived near him. 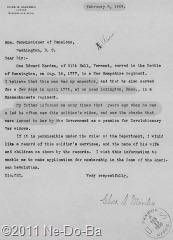 The commissioner responds, providing Charles with information from Edward’s pension file which is the same as I have just finished exploring with my readers; dates of enlistment, widow’s name, dates of marriage & death, mention of an unnamed wife and mention of an unnamed son, when pensions were filed for etc..
On 15-Mar-1909 (five weeks after his letter to the Commissioner), Charles write to the Annis family historian. In this letter he says he has “examined the record in the State Historical at St. Paul” and found information that Edward Marden served as a Minute Man in April 1775, then lists Edward’s service in the Rangers and Dearborn’s Regiment. Except for the statement about being a Minute Man, the information is the same he was recently provided by the Pension Commission. Charles mentions Chloe Barnes by name and states “I have heard father mention this woman as being the widow of his great grandfather”. Well, he did not seem to know her name when he wrote to the commissioner 5 weeks earlier. His father and grandfather have passed away, so they couldn’t have been consulted. The pension record and 1850 Census makes it clear Chloe has remained in the Lyman/Lisbon region until at least 1858, which covers the period when Riley Hull was “a lad” living in Albany and Randolph, VT. Riley probably did often visited a widow collecting a pension, but I’m not convinced he was visiting this widow. Why does it matter? I am only trying to determine what Charles knows first hand and what he has heard, is assuming, or is speculating about. Well, I have been through the pension record with a fine tooth comb. I don’t see anywhere that it says the son lived in Lyman. Edwards says the son does not live with him, and nothing more. I have found nothing to suggest Edward Sr. lived at Bath, but Bath is just south of Lisbon and Lyman, so I won’t pick on that. I do believe that Edward Jr. is the son of Edward Sr., but I disagree that “Junior” indicates they are father and son. A good researcher should never assume Juniors are sons. My own research experience has found many “juniors” in town records that are clearly not (using those same town records) father and son. In my own family they are Uncle and nephew living in the same town. I have also seen cousins, one much younger than the other but with the same name styled junior and senior in records. It was just an easy way to tell them apart in the town records. They needed to know which one to collect which taxes from! Charles is trying to be a good researcher learning about his family. He is visiting historical societies, writing letters, etc.. However, it seems to me he is not giving us facts that he knows first hand, he is compiling data from other sources and making some assumptions from his data that may turn out to be false after more research. The last letter from Charles that I would like to explore in dated 15-Feb-1918 to the Pension Commissioner. Charles says “I think this soldier had three wives”. Charles is still working on the family history and has come to the conclusion for himself that Edward must have had an earlier wife. He is hoping the pension file has more information. I think he has realized that the wife of 1820 who was age 40 could not be the mother of Edward Jr. and therefore he is trying to identify who was the mother of Edward. This is the wife that would be Charles’ ancestor. Now, the big question I am left to deal with here is – was Edward Marden a Minute Man in 1775? This could be important, because if he was in Massachusetts this might lead us to where Edward lived and possibly where we might look for Edward’s parents.